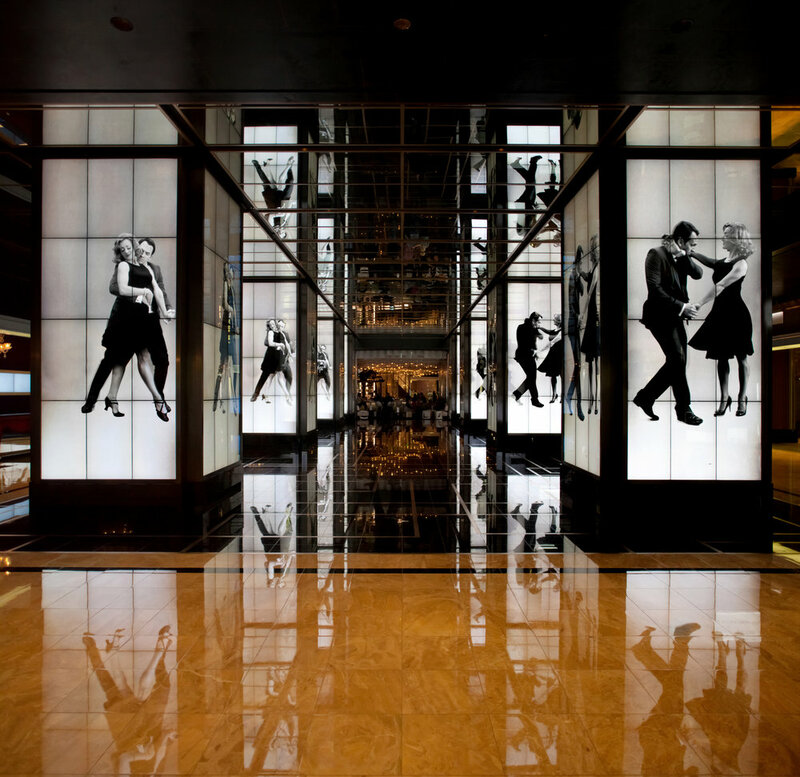 The Cosmopolitan of Las Vegas is the sixth most instagrammed hotel in the world. As you cross through into the West Lobby you are transformed by the experience. The project exhibits many of the beliefs we developed at the LAB at Rockwell Group. It's a platform for digital art, it's generative, and it encourages repeat visits as the experience changes over time. The West Lobby was a fantastic example of a project where we transformed challenges into opportunities. The West Lobby was a small, cavernous space to begin with, with 8 robust columns in the center. We turned this space into an intimate and kinetic experience by dematerializing these columns by wrapping them, with two way mirrors and LCD screens, which we programmed with many different immersive digital experiences. Mock-ups, prototypes and modeling allowed us to experiment and test the complex interrelationships materials, forms and technology. We experimented with various display technologies in pursuing large-scale seamless columns before settling on new nearly bezel-less LCD monitors, including an involved series of scale mockups with everything from LED tiles to flip dots. 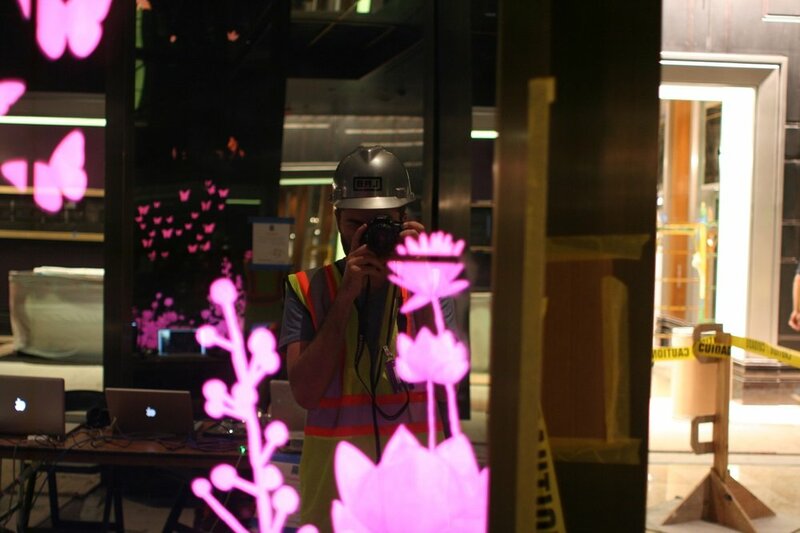 For the two-way mirrors wrapping the columns, we studied many different materials over the LCDs, in an effort to discover one that would create the floating effect that the imagery now has on the mirror material we ended up choosing. We created a scale mockup in-house to test content. Because of the overwhelming size and amount of displays and computers, this process also included months of on-site testing with the actual columns. All the content we developed had to be custom tailored to the environment, the colors had to be adjusted to amplify the mirror element, the pace and scale of all moving elements had to be finely tuned to create a dimensional, active environment. The project was built as a platform and we are really proud that work continues to be produced for it. 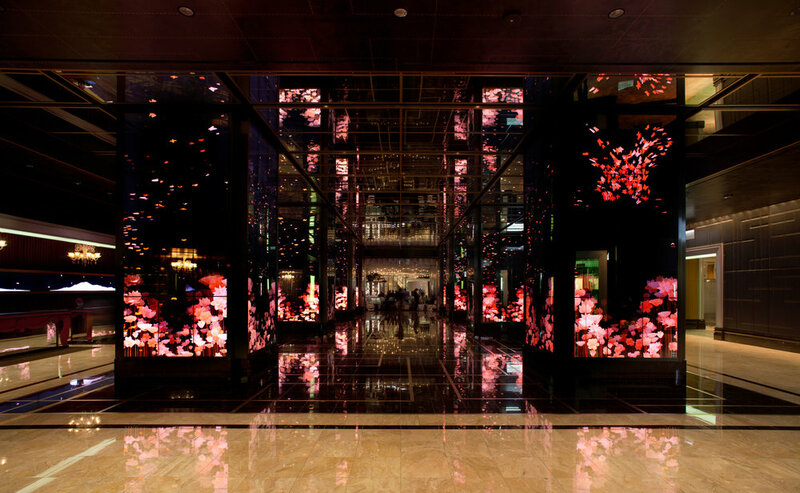 The LAB at Rockwell Group, Digital Kitchen, Bitforms Gallery, and the Art Production Fund have all produced a number of amazing digital experiences for the columns that have shown us a number of new ways to see the West Lobby itself. The vision of the team at the Cosmopolitan of Las Vegas to support this platform was wonderful. The main idea being that digital, generative content would appear more 'living' than linear content. This was one the LAB's larger scale installations of an Operating System for a Space (in this case we wrote the Environmental Choreography System in conjunction with Clockwork Media). Thinking of the space as a system with sensing and actuation will provide for many interesting interventions in the future. Sixth most instagrammed hotel in the world. 384 displays on the columns and 26 displays behind registration all integrated into a single digital / physical platform. 1920 x 4320 pixels per column surface (8 Columns) for a total addressable pixel dimension of 61440 x 4320 pixels. Here is a simple sample of real code that runs on the columns (written in Openframeworks). Because each bubble that is released has it's own properties even this simple code will create an incredible number of variations. This variation is great for visitors, staff, and longevity of the installation. This code monitors the number of bubbles on the screen at any given time and releases new bubbles to keep the screens within a pattern of possibilities. Viewing this project years later it almost feels like a Mixed Reality experience to us. It blurs the line between the physical and digital and gives the digital a real sense of presence in the space. Interested in creating a digital platform in your space?